The reason for starting the Flower Show is unknown. It might be that other villages were holding them and the residents of Chelveston didn't want to be outdone, or it might that a group of keen growers met in the Star & Garter one evening and decided to hold a competition to settle some rivalries. Whatever the reason, 1879 appears to be the year when it all started, and it ran for at least 11 years to 1889. It was revived in an updated format in 1987 and ran for 10 years to 1996. The first Flower Show was held in the Village School (now the Village Hall), and was only open to residents of the parish. The second annual show expanded to include competitions for exhibition of Army shoes for competition in both making and closing, and an exhibition of lace for competition. James Moyes Gray (land agent to Mr Henry C. Wise) was the president. Frederick Robert Eady (land surveyor & accountant) and Jebez Browning (farmer) were the honorary secretaries, and Samuel Denton (farmer) was the treasurer. Messrs. J. Page, T. Britten, T. Bonfield, W. D. Knight, J. Bonfield, T. Newell, J. Burton, W. Britten, L. Newell, F. Morris, J. Holyoake, G. Whitney, and E. Newell, were the committee members. The 11th annual flower, fruit, and vegetable show was held on a Monday, in a field kindly lent by Jebez Browning (farmer) near Caldecott. This year it included a football contest. This appears to be the last one recorded in the newspapers. 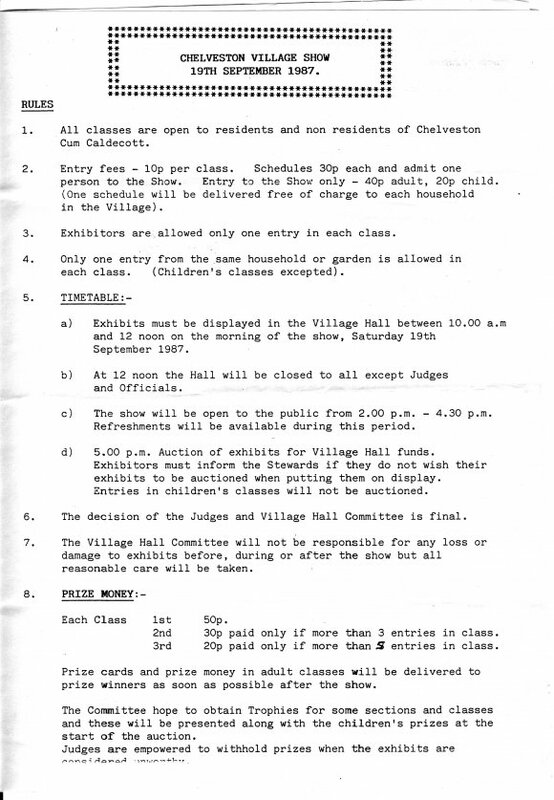 First held on Saturday 19th September 1987 in the Village Hall, it was called the village Show, and the classes were open to all. There were 62 classes (10p entry and 50p First Prize) split over 6 adult and 3 children's groups - Vegetables, Fruit, Flowers, Cookery & Domestic Science, Floral Art, and Arts & Crafts. with under 8's, under 13's and under 18's. There were 150 entries, and including the auction of the entries, a net profit of £44.70 was made. The 1988 show followed the same format, but trophies were now available to award to the winners of some classes. Michael Foulger was the Hon. Secretary and Mick Pullen was the Organiser. There were 97 entries, and including the auction of the entries, a net profit of £44.88 was made. The 1989 show followed the same format, but with only 61 entries. The format was revised in an attempt to reverse the falling numbers, with only 53 classes (including two for the fancy dress) split over the same groups. The 1990 entry fee had increased to 20p and there were 97 entries. Including the auction of the entries, a net profit of just £1.85 was made! The 1991 show had 75 entries, but including the auction of the entries, a net profit of £58.92 was made. The 1992 entry fee had increased to 30p and there were 113 entries. Including the auction of the entries, a net profit of £119.85 was made. The 1993 show had 133 entries, but including the auction of the entries, a net profit of £112.04 was made. The judges were Mrs C.Browinng (Milton Ernest), Mrs A. McGovern (Stanwick), Mrs C.Rice (Raunds) and Mr D.Marsh (Sharnbrook). The 1994 show had 89 entries, but including the auction of the entries, a net profit of £85.06 was made. The 1995 show had 108 entries, but including the auction of the entries, a net profit of £91.35 was made. The number of judges had been reduced from 4 to 3. The 1996 show had 76 entries, but including the auction of the entries, a net profit of £32.03 was made. The number of class had been reduced to 44. The organisers appear to have decided that the Village Show had run its course and accordingly 1996 was the last show.